Jeff Hammerberg, founding CEO of GayRealEstate.com, a service connecting clients with compatible agents, is releasing his new e-book Ready to Retire? Making Your Retirement Goals a Reality: A Guide for the LGBTQ Community for free download. Ready to Retire? 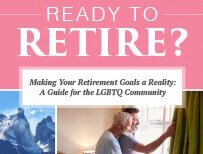 Making Your Retirement Goals a Reality: A Guide for the LGBTQ Community provides an extensive guide for those facing the exciting new chapter of retirement, with a special focus on the unique needs of LGBTQ retirees. The book is geared both toward those on the cusp of retirement and those long-term planning for retirement, alike. The informative book gives real world advice on how to plan and prepare for an ideal retirement. It is primarily focused on answering real estate-related questions so that readers will have the needed tools and knowledge to enjoy their golden years to the fullest. Ready to Retire? Making Your Retirement Goals a Reality: A Guide for the LGBTQ Community is a helpful tool which teaches readers how to set practical goals to help them achieve their desired retirement situation. The GayRealEstate.com team is committed to ensuring that their clients are connected with agents who will represent their best interests and treat them with respect. The real estate service links clients with trustworthy gay, lesbian and gay-friendly agents who have been interviewed and investigated extensively and maintain equal respect and dedication for everyone. GayRealEstate.com is dedicated to eliminating the stress and uncertainty of searching for professionals who will respect each client’s dignity. With more than 25 years of experience as the industry leader, GayRealEstate.com is proud to support the LGBTQ community and strives to ensure that every real estate transaction is conducted with integrity, void of discrimination and intolerance.